There weren’t many Official Stills of Season 1 that immediately sparked my interest, but it’s fun to look over them again, now that it’s been many months since I’ve seen the episodes for the first time. We got 11 Official Stills for this episode via SpoilerTV and two more via Getty Images. Most of them feature the cast standing around, looking critically at something. There’s a touch of CSI. MY FAVORITE: That’s very easy: The one with Mac and Alfred Pena’s daughter Annabelle; curtesy of Still Photographer Guy D’Alema. It looks very heartfelt and genuine. 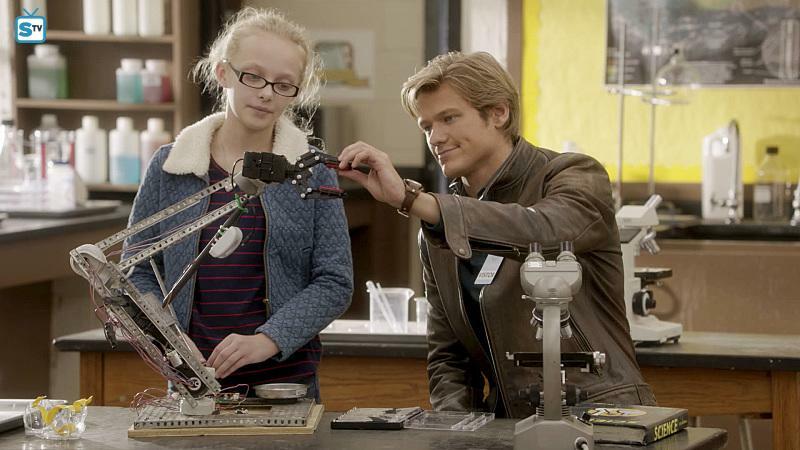 This was also the first Still that actually reminded me of Original MacGyver. NOW THAT’S DISAPPOINTING: Still no SAK, although it plays a crucial part in one of the MacGyverisms. For this episode, we got 9 Stills via SpoilerTV and 3 more via Getty Images. All but 2 of them feature MacGyver in orange prison garb. Again, no Still of Bozer. But there’s also no Still of Thornton. MY FAVORITE: MacGyver being interrogated by El Noche. There’s a sense of danger here. And I like the lighting. NOW THAT’S DISAPPOINTING: Not that much. We see MacGyver in prison and Jack as a cop and want to know what’s going on. Also, the Original Show had an episode with MacGyver and Jack in prison as well. The 8th episode gave us 7 Stills via SpoilerTV. Sadly, they’re all from the same scene: The one with Murdoc chasing MacGyver across a junk yard. MY FAVORITE: The one with MacGyver in the junk yard *lol*. The episode granted us 17 Stills via SpoilerTV. Several of them feature Bozer while Riley and Thornton only appear as a side-note. The majority of them show MacGyverisms, which makes it pretty exciting. MY FAVORITE: I have some difficulties choosing a favorite, actually. I like this one because of the unusual perspective. NOW THAT’S DISAPPOINTING: The Stills are of a different quality. They’re kind of… milky? I can’t really explain it. There’s also no Still Photographer listed yet on IMDb; maybe they didn’t have one? So many MacGyverisms to show, yet still no SAK. We only got 6 Official Stills via SpoilerTV for this episode. They all feature MacGyver teaching or doing science stuff. It feels very Original MacGyver to me and made me forget that “Team Phoenix” won’t be far away. MY FAVORITE: Not much to choose from – it’s either Mac teaching in front of the class or teaching Valerie. But that’s fine. It’s nice to see Mac with a kid being interested in science; especially a young girl. Reminds us a bit of the Ugly-Duckling-Episode, right? NOW THAT’S DISAPPOINTING: So much science, but still no SAK. Also, I don’t really understand why they never have additional Stills with guest stars. Yes, John Heard doesn’t have that much screentime in this episode but his name and work is well-known. Why not use it for Promo? Disclaimer: My original guest-post was first published on The MacGyver Project on November 11, 2016. I made some minor changes (e.g. grammar or source corrections, link corrections, additional pictures) before re-posting it on my own blog for safe-keeping. Cast and crew are busy working on more episodes until they get to enjoy a break over Christmas. Also, our favorite villain will come back in today’s episode! As I mentioned last time, we don’t see much current material anymore from the main cast. 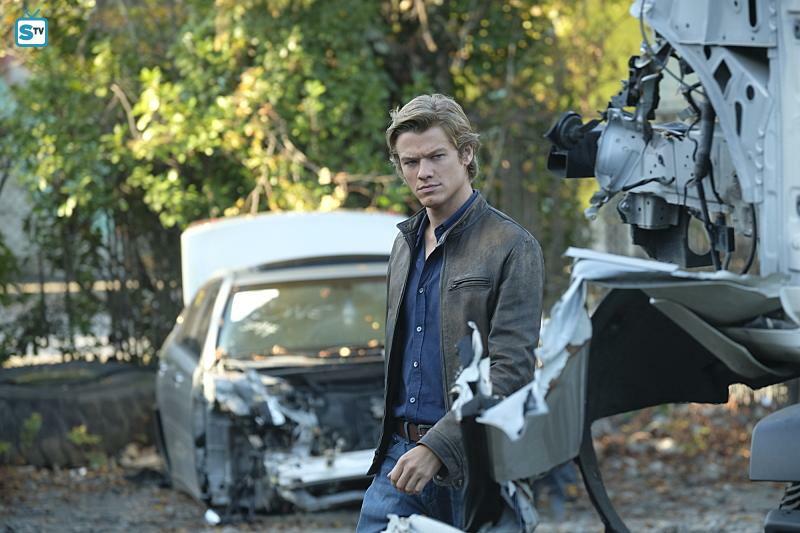 Lucas Till posted some pictures of MacGyver doing bad, bad things like stealing money and holding guns. He also shared some new stills and BtS-pictures of Episode 7. Justin Hires posted a nice picture of the male trio. We also got a throwback to Episode 2 (Metal Saw): SkyDroneCinema just posted a video today of Jack and MacGyver chasing “Julio”. It looks like they’re filming a Christmas Episode at the moment. First, Executive Producer Peter Lenkov posted paperclip art snow flakes on November 8. The next day, he shared a picture of Christmas Stockings. Looks like Jack has been a naughty boy! FlyWorx did some more drone work at the end of October. Cornell Willis, “cartier_vision2“, Shannon Helliker and James Grabowski posted several location pictures. Crew and Extras are still very careful not to post any spoilers, though. Stand-In Mikey Leo granted us a look at the “second team” while Extra Aimee Carrero assures us she’s acting “totally normally” in her scene. Brian Durkin (who wrote Episode 6) shared visualizations and early drawings of an old school bomb defusal technique called “tape and line”. According to his statements on Twitter, he had many conversations with real bomb defusal technicians while doing research for the script. I assumed ratings would rise some more for the Halloween Episode, but I’m not up to date with sport events (especially not sporty events abroad) and didn’t take into account that the world series would have an effect. So, it’s no surprise that ratings for Episode 6 (Wrench, 7.27 million) have been lower than expected (which is a shame because I actually think this episode was the best so far). Nonetheless: The Hashtag #MacGyver has been trending again – as it has for every episode premiere this season. The script writers were live tweeting on November 4 for Episode 7 – this time together with the writers on Hawaii Five-0 who celebrated the release of Episode 150. Episode 7 (Can Opener, 7.59 million) got better ratings and the numbers might rise again for Episode 8: I assume that many people will tune in for the return of Murdoc – maybe even people that have abandoned the show after the pilot or the first few episodes. SpoilerTV provided us with official stills and press releases for Episode 8 (Corkscrew) and 9 (Chisel). Episode 9 will be directed by Brad Tanenbaum (CSI: Las Vegas) who shared a picture of himself on set on October 29. Episode 10 is called “Pliers” and directed by Lee Rose. We got several sneak and previews for Episode 7; e.g. by Yahoo or by ET Online. Stunt Extra Raul Colon shared a few BtS-pictures of his Laundry-Room-Fight with MacGyver. Entertainment Weekly brought an exclusive clip of Episode 8, where Bozer meets Murdoc. It fits the short video clip that Peter Lenkov posted a few days earlier with Team MacGyver all dressed up for a mission in an Art Gallery. CBS Watch! Magazine revealed on October 28 that there will be a feature article including a photoshoot with Lucas Till and George Eads in January. On November 2, Peter Lenkov shared an article by TVGuide for Episode 7. TVLine did an interview with David Dastmalchian about his take on Murdoc. TVInsider spoke with Lucas Till and George Eads. Lucas revealed that he hasn’t reached out to Richard Dean Anderson yet and that he’s a little afraid of what RDA would have to say about the show and his take on the iconic character. Central Casting Georgia has made several casting calls; e.g. for middle school students, for motorized scooters or for Asian men and women with military and gun training experience. It seems like Arnold Hernandez met the guy who is responsible for the paper clip art. Hernandez put Lee Folds to the test and got a paperclip guitar in return. That’s pretty awesome and I really hope we will get some BtS-material or an article about these little props some day. We already know that both Murdoc and Nikki (Tracy Spiridakos) will show up on Episode 8. On November 4, Justin Hires confirmed our suspicions that he will join Team MacGyver. According to a tweet by Vinnie Jones, he also might come back to “kick some asses”. Looks like someone still holds a grudge. Disclaimer: My original guest-post was first published on The MacGyver Project on October 28, 2016. I made some minor changes (e.g. grammar or source corrections, link corrections, additional pictures) before re-posting it on my own blog for safe-keeping. While I’m not all that happy how the reboot is handling the characters and storylines, I think the full-season pick-up order is a good thing: Now we have the chance that the writers and producers listen to us to make the necessary changes for the rest of the season. We might have the chance to get a reboot that rightfully deserves its title. Also, the show will be picked up in other countries so that many more people get a chance to discover MacGyver – hopefully also the original show and therefore the talented RDA and his creation of a very likeable and humble hero, an awesome theme and some great TV show music along the way. 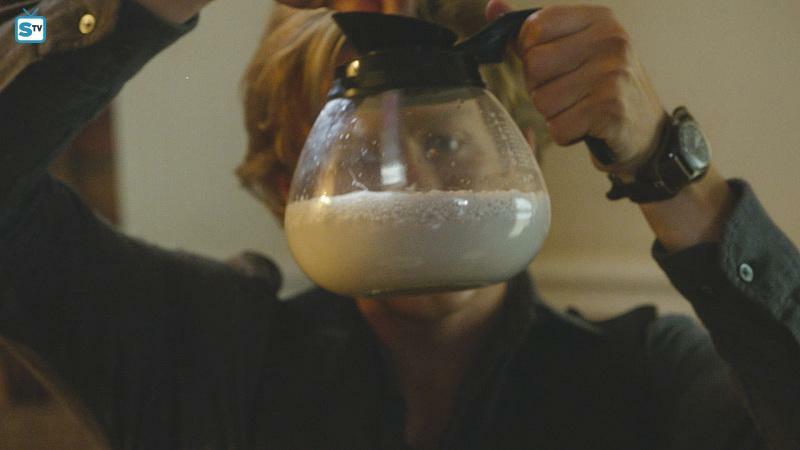 Episode 6 will reveal some more of MacGyver’s bomb defusal days. Emerson Brooks revealed that wearing a bomb defusal suit in a bright-lit studio in summer for 13 hours isn’t very fun. On October 21, he posted an additional picture of him doing voice-over work. Episode 7 will be set in prison. Many extras have posted prison set pictures during the last few weeks. According to Stand-In Briana Lamb, fall has come to the MacGyver set. She also posted a BtS picture of the battered rubber duckies that are usually seen in very well condition in MacGyver’s home. I’m still not sure if the duckies are an hommage to MacGyver or to Richard Dean Anderson (who is known to have a special bond with rubber duckies). We got another example of the script writer’s way of visualization; this time on Episode 5. It’s good to know that you don’t need artistic skills on top of writing skills to write a script; so maybe there’s still hope for me (ahem). We don’t see much BtS-material anymore from the main cast members. Mostly, they retweet or post stills or trailers for the upcoming episodes. George Eads’ official accounts are still disabled – I guess he wasn’t that fond of social media to begin with, but rather “pressured” into signing up for promotional reasons. 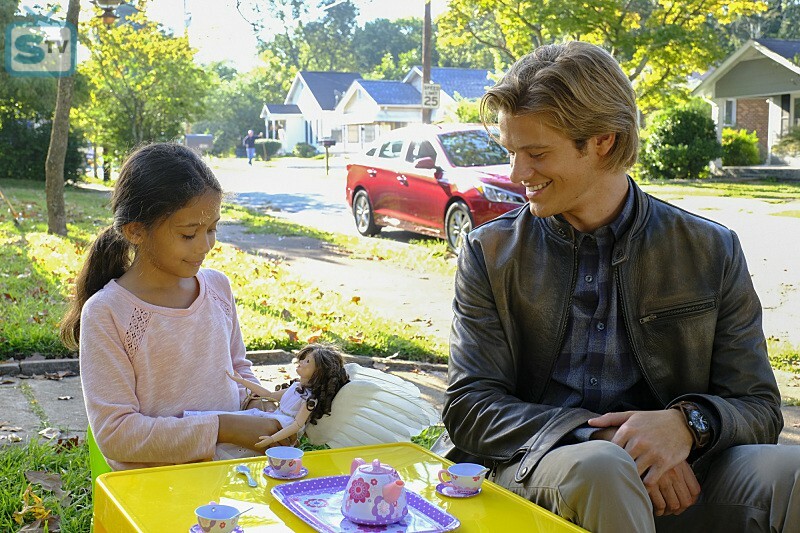 Both Lucas Till and Tristin Mays shared a picture of themselves with Elya Baskin, though – he’s the first guest star of the original show and appeared on Episode 4 (Wire Cutter). Battlecat Stunts shared a short video and a picture of Episode 5. It’s quite impressive how smooth the “bad guys” drop from a rig onto a narrow train roof. Good thing I’m not a stuntwoman doing stuff like this on a daily basis; because this looks scary. The previews for Episode 6 seem very action-driven and “Wrench” is the precursor of the well-advertized Halloween Episode of Hawaii 5-0, so it’s possible the ratings will rise some more this Friday. The official preview for Episode 6 (that will be deleted like all the other previews on the official YT-Account, sigh) does make me curious, though. There seems to be potential for a storyline that might not be finished in a single episode, for an insight into Mac’s psyche and for a Murdoc-like villain. CBS also provided a sneak peek of one of the explosive stunts. TVLine shared an exclusive clip of Mac trying to defuse a bomb in Episode 6. This clip needs a huge spoiler alert warning, though and it’s not the first time I wonder why CBS decides to hand out an entire MacGyverism scene. I don’t remember if I’ve already mentioned this, but another well-known character name of the original show will pop up in today’s Episode 6: Charlie Robinson from “Countdown” (Season 1), this time played by Emerson Brooks. Disclaimer: My original guest-post was first published on The MacGyver Project on October 14, 2016. I made some minor changes (e.g. grammar or source corrections, link corrections, additional pictures) before re-posting it on my own blog for safe-keeping. Episodes 2 and 3 generated a lot of buzz on social media although ratings have dropped since the premiere of the pilot episode. The first guest star from the original show will make an appearance on Episode 4 and New Murdoc has been cast! Cast and crew are busy bees and don’t have much time to post on social media anymore. On October 4, Executive Producer Peter Lenkov provided a sneak peek of the editing process on Episode 5 and a first look at Episode 6. He also revealed that one episode they’re currently working on has MacGyver and Wilt on a camping trip. Stand-In Briana Lamb shared pictures of her while rehearsing with George Eads. George’s Stand-In Mikey Leo informed us that they had a snake wrangler on set on October 6. Extras Paul Trujillo and Terence Goffer shared pictures of working on a prison set while writer John Turman showed us Jack Dalton’s car. A very nice vintage car. I hope they don’t take it apart again… but I guess when MacGyver and Bad Guys are involved, you never know. Of course, there’s also work to be done behind the set. Lucas Till shared the fun of doing voice-over on Episode 3 (Awl). Just before the episode premiered on October 7, he posted several BtS-pictures on his Twitter-Account; e.g. of MacGyver and Wilt working on Wilt’s movie. Nancy Kiu revealed how the writers visualize escape sequences (presumably for Episode 2). Keith Power shared sound-bite-videos on Instagram; e.g. of playing and recording drums or a variation of the Phoenix Foundation Theme. I think this theme sounds great and I’m a bit miffed that I don’t remember it at all in any of the episodes that have aired so far – probably because I’m not happy with the reboot’s music or the sound overall since the score and huge portions of dialogue constantly drown within the too-loud-soundtrack-songs. While almost 11 million people had been watching the pilot episode on September 23, the ratings have been dropping for Episode 2 (Metal Saw, 9.1 million) and Episode 3 (Awl, 8.1 million). The ratings are still strong overall, though and the Hashtag #MacGyver trended on Twitter both times the episodes premiered. The writers kept live-tweeting and providing some more pictures; e.g. a closer look of the photo on Jack’s Driver’s License or the Pizza Box from Zlotoff’s Pizzeria. SpoilerTV provided us with official stills and/or press releases for Episode 4 (Wire Cutter) and 5 (Toothpick). They also revealed the title for Episode 8: Corkscrew. Additionally, we got another still of the Russian Bomb for Episode 4. On October 5, CBS posted more BtS-Photos on their website. According to IMDb, Episode 10 will be directed by Lee Rose (Grimm, Code Black). She will be the first female director so far – not just for the reboot, but for any MacGyver episode (if I remember correctly). Peter Lenkov provided us with several short videos; e.g. of MacGyver and Jack trying to stop a runaway train (Episode 5), Thornton getting Riley field-ready or Jack singing Salt-N-Pepa’s “Push it” (Episode 4). The whole sequence of Jack showing off his karaoke skills can be found on TVLine. ET Online takes a look into the “Bromance” between MacGyver and Jack. Yahoo spoke to guest star Amy Acker while Collider did another interview with Lucas; talking about the challenges of filming an action show. Parade did an interview with George; the Military Times had a talk with Lucas and his father John. Central Casting Georgia has made a casting call for art patrons who “look like a million bucks” and for caucasian females in their 20s or 30s. The first guest star from the original show will make an appearance on Episode 4 (Wire Cutter): Elya Baskin, who played political Russian prisoner “Demetri” (A Prisoner of Consience, Season 1) and defector Yuri Demetri aka “Biff” (Soft Touch, Season 2). On October 11, Entertainment Weekly shared the news that David Dastmalchian (12 Monkeys, The Dark Knight) has been cast as Murdoc for at least one appearance. It will be interesting to see how David tackles this iconic role. It seems the cast is not tired yet of seeing each other off-set. Lucas and George watched some Georgia Tech Football on October 1, while Tristin Mays revealed on October 6 that she had joined George, Lucas and Tracy Spiridakos at a Baseball Game.